These cookies start as your basic shortbread. Add a touch of water to the dough if necessary to get it to come together. Then, stir in the sliced almonds and chocolate-coated toffee bits to mimic the Almond Roca flavors and textures. I went for slightly more toffee bits than sliced almonds but you can simply go with about equal proportions. I made a double portion of the original recipe so I divided the dough in half before chilling. I was a little concerned about how this dough would be to roll out. Luckily, I had no issues rolling the dough out to a 1/4 inch thickness before cutting out the rounds. I also cut some using a fluted rectangle cutter and you can essentially use any shape you prefer. I baked some up and stowed some away in my freezer for another day. One should always have some extra Christmas cookies on hand at the ready! 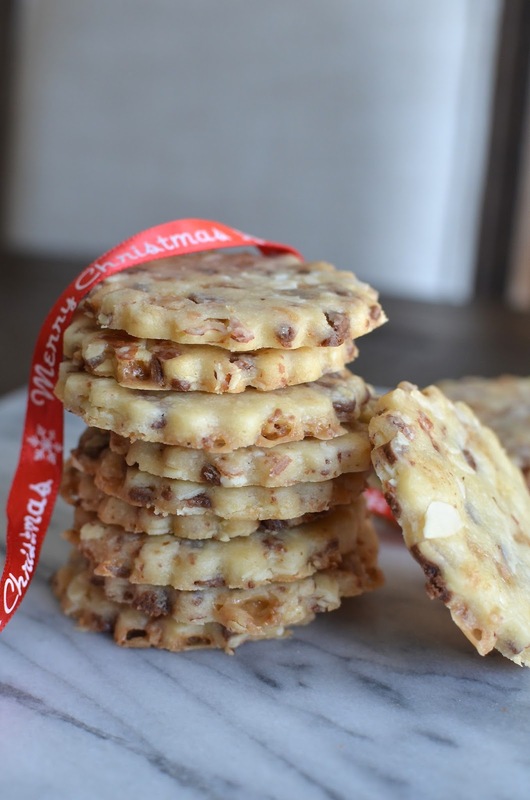 A little bit of toffee might ooze out the corners during baking but you'll find they don't spread much and you'll have a relatively neat batch of crunchy, buttery Almond Roca shortbreads to enjoy with your family and friends. ...but maybe not all that much time! The clock sure is ticking and I think it's getting on time to wrap up all the baking and sit down to really enjoy all our efforts. I have an all-important batch of Italian tri-color/rainbow cookies to make and then the cookie-baking will take a short hiatus, I think. I wish you all a very happy holiday with your family and friends! May the New Year bring happiness, good health, great food, new adventures, peace, and kindness to all! In the bowl of a stand mixer fitted with the paddle attachment, cream the butter, sugar, and vanilla together until smooth. Add flour and salt, mixing until just combined. Check the texture of the dough. It should come together when you pinch it; if necessary, add 1-2 teaspoons of water to get the dough to the desired texture. Stir in the toffee bits and almonds with a rubber spatula. Transfer the dough onto a piece of plastic wrap, shape it into a disc, and wrap firmly. Chill the dough in the refrigerator for 1 hour or until firm. Remove dough from the refrigerator and set it onto a lightly floured surface. Roll the dough out into a 1/4 inch thickness. Cut out cookies using desired cookie cutters, re-rolling the scraps once. Place cut cookies onto a parchment-lined baking sheet, spaced about 1 1/2 inches apart. Bake for 12-14 minutes, until lightly browned. Remove baking sheet from the oven, let cool 5 minutes before removing cookies onto a baking rack to cool completely. Almond and toffee...an irresistible combo, Monica. These cookies would disappear in no time if baked them. Cookies do disappear fast, particularly at this time of year! Happy holidays! The perfect cookie for the holidays! I am a fan of almond roca so I have to give these a try. SO creative and it must be the perfect bite. I bet these would travel well too. Thanks for sharing Monica! I hope you and your boys have a fantastic Christmas. Many blessings! It's amazing what you can tuck into shortbread! I was a little worried this wouldn't work out but it was just fine and tasty. Thank you so much and have a wonderful Christmas with your family. Time to relax and enjoy! I can't say I've ever had almond roca but I sure love the sound of it!! I hope you have a very merry christmas monica!! sending warm wishes to you and your family! Same to you, Ashley! Hope you have a wonderful break, taking time to enjoy your family and all the good stuff life has to offer. It's the perfect time of year to just take it in and savor the good. Best wishes for a fantastic New Year to you and yours! Shortbread cookies just scream CHRISTMAS! They are my favorite. So simple and so delicious. I agree. I don't make them very often but at this time, I'm just thinking about them all the time. You forget how good a simple shortbread is and then you realize there are tons of spins you can take with them, too. Merry Christmas! Love these dipping cookies! Perfect with a cuppa or anytime during the day. Wishing your family a safe and happy holiday season and a super 2018! A very happy holiday and all the best for a happy, healthy, and peaceful New Year! Hi Kelly! Thanks and I found these thanks to you. It was fun to make and we all enjoyed it. Hope you have a relaxing Christmas with your family. Much happiness, good health, and peace in 2018!! What fun and deliciousness to tuck your childhood candy memories into these pretty shortbread cookies! Great idea adding the chocolate inside the cookie! Shortbread comes in so many shapes and flavors and I love them all. I hope you have a joyous Christmas and a healthy, peace-filled New Year! Christmas was wonderful and we really savored the break. Hope you had a great holiday and all is well in 2018! Thank you! I know I would love these cookies...I've pinned it. I appreciate that and wishing you and your family happy travels and best wishes for this new year!